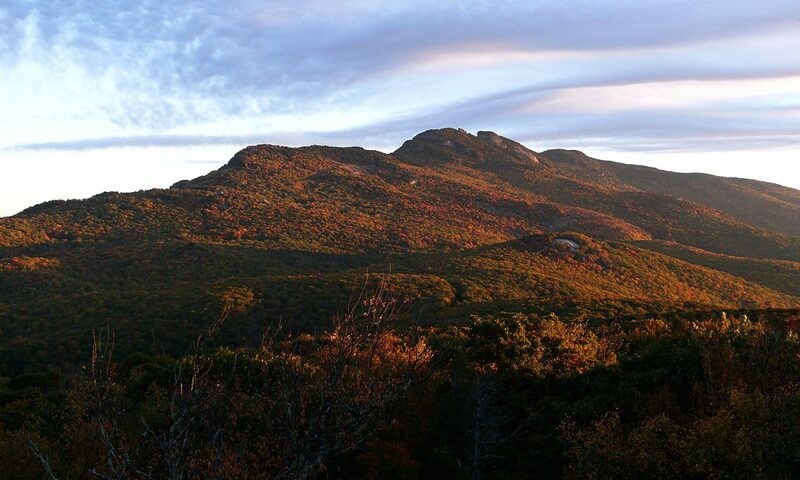 The marathon begins at Kidd Brewer Stadium in Boone, NC at 6:30 am at an elevation of 3,333 feet and climbs to an elevation of 4,279 feet where it ends on Grandfather Mountain in Linville, NC. The course is mountainous and very scenic as it winds through the Blue Ridge Mountains. The course is run predominately on asphalt (3 miles of the course is on gravel). The race will finish at McRae Meadows during the Highland Games, the 2nd largest Highland Games in the world. So make sure you look good at least at the finish in front of those 5,000+ spectators! NOTE: Much of the course will be run on state highway where traffic cannot be stopped to accommodate the runners. No early starts allowed! Start at Kidd Brewer Stadium at Appalachian State University in Boone, NC (off of River Street). After not quite 2 laps around the track, the runners leave the stadium and proceed out of the parking lot to Stadium Drive, turn left down the hill to Rivers Street. Take a right onto Rivers St at the stop light. Follow Rivers Street to the end at Highway 321 and turn right at the Holmes Center onto 321 S.
Stay on 321 (Blowing Rock Rd) pass Wendy’s on your right. Turn right onto Winkler’s Creek just after Bojangles. Pass the stop light at Boone Mall. Cross a small bridge and take the 2nd right onto Winkler’s Creek Rd. Stay on Winkler’s Creek until you come to SR 1550 (Russ Cornett Rd). Take a right there. This is about mile 3. At the Intersection of Russ Cornett and Diamond Ranch Rd, turn right. Follow Diamond Ranch to Poplar Grove t-intersection. Turn left on Poplar Grove.This is about 5 miles. Stay on Poplar Grove Rd until it t-intersects with Shull’s Mill Rd. Take a left on Shull’s Mill Rd. Follow until you hit the Blue Ridge Parkway. Proceed to the Parkway and take a left onto the Parkway. You MUST obey Parkway rules and run on the left facing traffic – no cutting curves please! Take the Parkway to Holloway Mtn Rd. At that exit, cross to the right lane to exit off the Parkway. At the bottom of the exit ramp, turn left onto Holloway Mtn Rd. Go under the Parkway bridge on Holloway Mtn Rd. This is mile 15. Turn right on SR 1561 (Clarence Newton Rd) which is gravel. Follow this gravel road to the end where it t-intersects with Hwy 221. Turn right on 221. This is about mile 17. Follow 221 up about 9 miles of long winding curves ! Just wait until you see these hills! This is a gorgeous section of the course. But it’s narrow, so use caution. At 24 miles, pass under the Blue Ridge Parkway and proceed up past the entrance to Grandfather Mt. attraction. Shortly after the Grandfather Mt entrance is a paved trail on the right (before Gate 3). Turn right off 221 onto this trail and then bear left on the gravel toward McRae Meadows. Then take an immedaite left and head down the gravel trail. In our mountains… what goes down must go up. At the bottom of that hill, bare right, but immediately bear left up the gravel road. There will be signs to guide you toward the finish. Pass the marathon tent on your left and continue up this last steep gravel hill. At the top of the hill, turn right up a grass bank toward the entrance to the infield. Enter the track clockwise and run 3/4 of a lap round the track to the finish line in front of thousands of spectators. After you get your medal, you will go back down to the marathon tent for refreshments and awards.